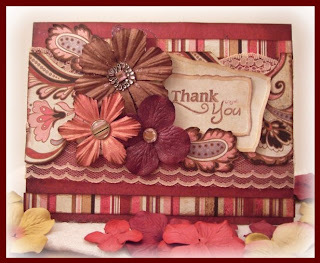 I wanted to show just a quick idea using Spellbinder dies and using up some stash that I've been saving! I've been busy organizing my scrap area and decided to make these little tags! 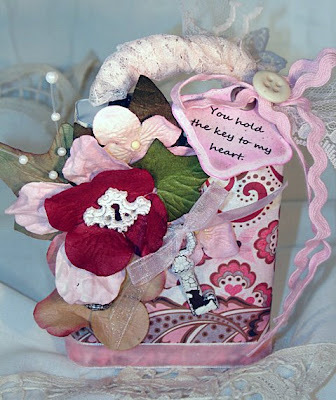 Be sure to check out the beautiful items from the girls on the In Our Paper Garden design team this week on ebay. 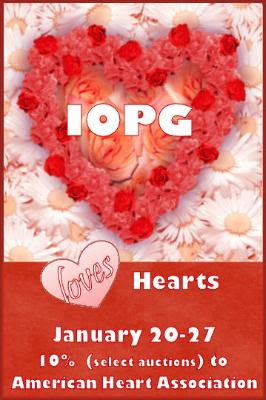 It's a great chance to get some of your valentine shopping out of the way and help out a great cause at the same time. All of the auctions with ribbons beside them will be donating 10% or more of the proceeds to the American Heart Association! Are you ready for some sneak peeks? CHA starts Sunday and we already have some of the new goodies arriving! It's always fun seeing the sneaks and it's always hard deciding how to narrow it down. We are excited to be introducing several new manufacturers to our line up this year and always thrilled to be stocking our old favorites. We've been busy blog hopping and hunting down the best of the best and can't wait to share it with you. Over the next few days check back and we'll give you a few previews of what to expect this spring and summer. Cosmo Cricket will be arriving Tuesday!! Check out these fun and adorable lines! To see more of the Cosmo yummies check out their blog. This year we are pleased to be adding Scribble Scrabble to the line-up. 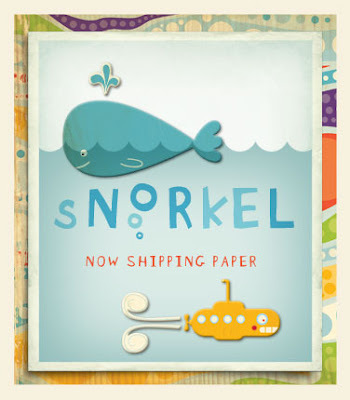 They've really outdone themselves with these fabulous double-sided patterned papers. They are designed to look like fabric and will be so much fun to play with. The Evelyn collection, seen below, is in stock now. We will also be taking pre-orders for the new Spellbinders. 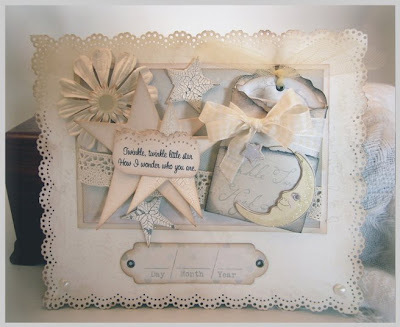 If you haven't seen their amazing new dies then take a peak at their blog. If you would like to pre-order any of the new dies just email me with your request and we'll let you know when they arrive. Over the next few weeks our online store will be getting a makeover so be sure to visit our Ebay store to make your purchases. Have you ever scrapped a picture that just makes you laugh? Everytime you look at it? This was my (then 2 year old) son's first Pre School professional pictures. His teachers said they did everything they could to get him to smile...but you can tell the thoughts running through his little brain! This great Prima Space Boy line is soooooo great for boys! I love the greens and blues and funky patterns of this line. This may be one of the most fun projects I've completed. This card was made for a "little" someone known as "Little Bean". You know, the cute nickname you give a baby before it is born? Well, one of our good friends in our design group is having her first baby and we couldn't be more excited about her and her hubbie's little bean. A voice recorder is hidden in the envelope so hopefully we will be getting to hear "little bean" soon! As usual, Basic Grey has the most beautiful paper lines! Bittersweet is perfect for Valentines Day, or anything about Love! 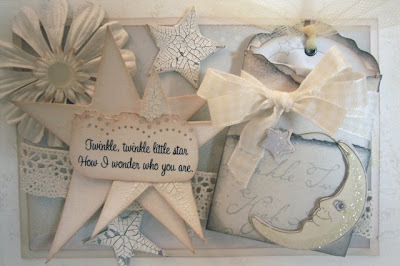 With this kit that Tammy created, I designed two gifts, one a tin (perfect for jewelry...hint, hint gentlemen! Or a gift card fits in perfectly too!) that I covered in paper and slathered in Prima flowers, then spritzed the new Cherry Blossom Glimmer Mist all over! I used the Glimmer Mist to change the color of one on the off white flowers, and deepen the pink of the others, then spritzed it on the tag too. 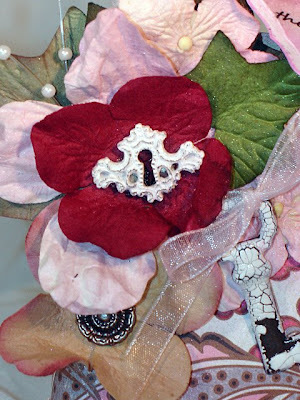 The Melissa Frances key hole is a perfect romantic center to one of the flowers too. 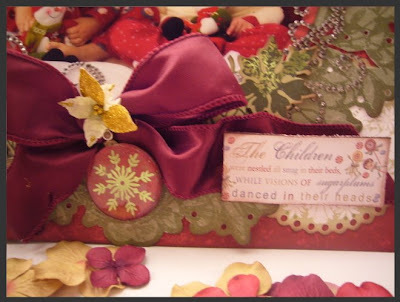 I use the lace and wrapped it around the handle, tied the other ribbon into a bow and added a tag I made with my Spellbinder die. This was a quick and beautiful project! 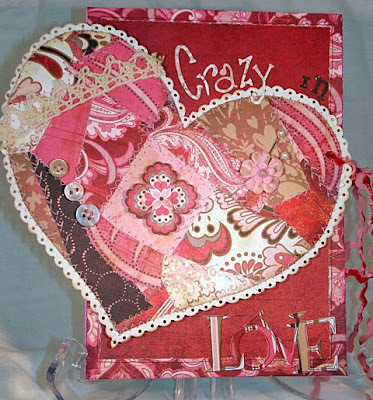 Then I made a HUGE Valentine's Day card for my sweetie! I love how the papers reminded me of a quilt, so I had the idea to make a "crazy quilt" out of the papers. Hence the sentiment, "Crazy in LOVE"! And there is still enough paper in this kit that after doing both of these projects, I have enough left over to do a layout too! 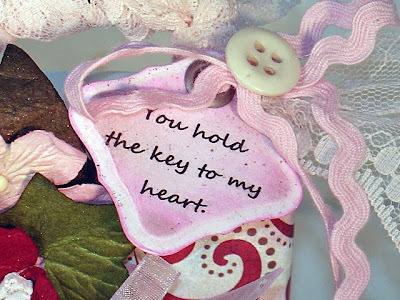 How about you trying to make something special for your sweetie? Take my ideas and see what you come up with! Oh, who knew in Kindergarten that I would having to deal with boys and kissing?? Sigh...I'm in for some rough teen years! 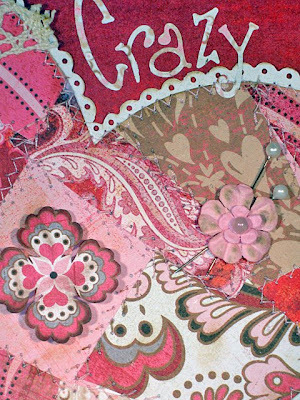 Here's a 12 x 12 layout with the Fancy Pants Splendid Kit we have available! I also used the Tim Holtz Fragments for the heart near my daughter (I used it to cover a big ugly orange sleeve that was in the picture)! I also included a rough sketch for you to follow! Thanks for looking! This just in! Page of the Month Kits! They're here, but they will go fast~ the much anticipated Pages of the Month! 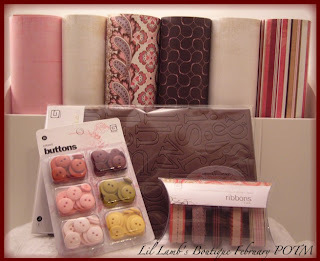 There is no guess work with these fabulous kits! All items have been hand picked to coordinate beautifully and provide you with all the items needed to complete these sample pages by Kelly Goree and Becky Fleck and still have a ton to spare! Each kit will include complete instructions and special notes from the designer to complete the look you want. These are the first of our 12 month series of pages by BasicGrey. Each month will feature a newly released BasicGrey line! And the Bittersweet Deluxe Kit is now available as well! Here is the first project using this amazing kit filled to the brim with yummy goodies! Isn't it time to get started on all of those Valentine gifts?? More projects will be added soon! So I hear you might have some holiday pictures to scrap? Say it isn't so! Well, you are doing better than I am if you are working on this year's pictures. This picture was from 2006 but I had been holding onto it because I just couldn't find the right paper to use with it. Luckily, this year Little Yellow Bicycle came out with a line that worked perfectly. 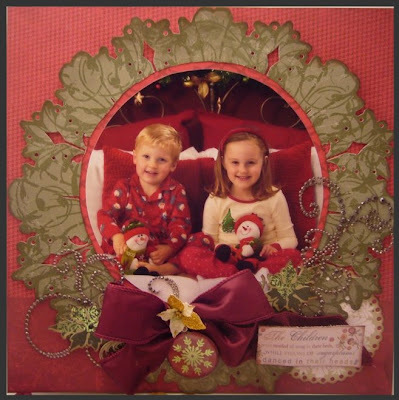 I just loved the die cut paper and traditional feel of this "Christmas Magic". I finished this off with some die cuts from the 8 x 8 LYB diecut tablet, some Prima Say it in Crystals and the perfect saying from Melissa Frances' ticket book. I was also able to try out Tim Holtz's fragments. 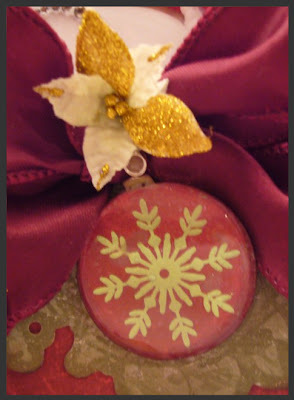 Just glued a circle right onto the die cut using glossy accents and made an adorable ornament. When I first saw this wonderful line of paper from Bo Bunny, I thought, "Oh, how perfect for a wedding page!". The blacks and creams of this line are so classy. But, the layout that came out first was a beach scene? Go figure! I loved the bright blue picture agains the creams and khaki's. Then I started a wedding page, and I did one of my parents. My father passed away almost two years ago, and I have not been able to bring myself to do any scrapping of him, but it did feel very healing in a way to do this page. My new years resolution is to try and scrap more family besides just my cute kiddos! I also used Ink, Prima Crystals, and Stickles to add a little bling to the pictures. The "1969" is done with Glimmer Mist...I have to find a way to use Glimmer Mist on almost everything ;-). Here are some cute little Valentines I made from this months "Splendid" Kit. 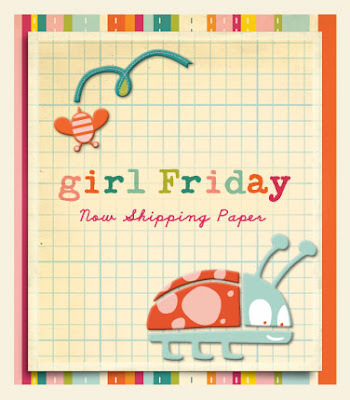 This paper is so cute, it has little Valentine's on the front and "To and From" on the back. Perfect for kids...oh, and I made one for Nana too! I embellished this with the Stickles and Ink also included in this kit! Check out all of the projects using this month's Deluxe kits here! I know you've seen them... the adorable mailbox tins that start to pop up before Valentine's Day? Here's a short tutorial on how to make one of your very own! The mailbox and all of the items needed can be found in this month's Splendid Deluxe kit. 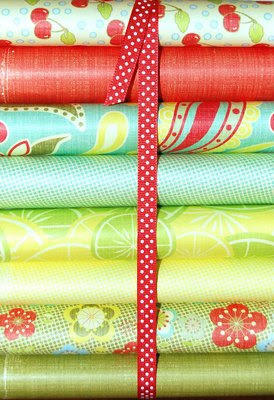 First, choose two patterned papers from the kit that you would like to use and cut a 4 inch by 6 inch strip from both of them. Next, lightly sand the mailbox and both lids to scratch up the surfaces. An optional step is to use Staz On ink to lightly go over the edges of the tin to give it a distressed look. Choose the paper you want for the top of the tin. I use Fabri-tac glue and adhere it to the tin tucking it under the flag as a starting point. Inking the edges of your paper also helps to give it a more finished look. Next, take your other paper and tuck it under the flag as your starting point and adhere with Fabri-tac glue. For the next step I cut a strip from another patterned paper to cover the seams on both sides of the tins. Ribbons or other trims are also cute to use for this step. Next, choose the paper for the front and back of your tin. Use the lid of the tin and trace it onto the back of the paper you are going to use. Cut them out and glue them to the front of the lids. After this step, I normally sand the edges of the paper and ink them so that they fit perfectly to the shape of the lids. And now for the fun part... decorate as simply or elaborately as you wish! But most importantly, have fun and imagine the smile on your Valentine's face when they receive your fabulous creation filled with candy or a special gift! Check back! More project ideas for the Deluxe Splendid kits are coming soon! To see all of the projects for this kit, click on the Kits category on the side menu. And we will also be starting the projects for the Basic Grey Bittersweet Deluxe kit as well! The Bittersweet kit will be available this week! Tussey Mussey's were filled with flowers in Victorian times...when you came upon an unpleasant smell (the neighbor? unruly horses?) you could place your nose in your Tussey Mussey and have a pleasant scent instead. Since most of the time we don't have too many smells to avoid...I filled mine with Valentine candy! 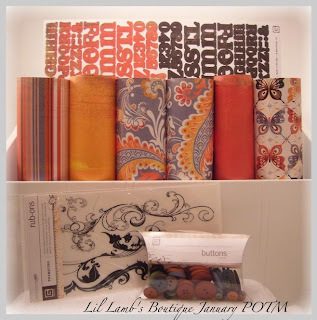 This paper line from Fancy Pants is so versatile! At first, I just loved the bright, fun, more traditional colors. Then as you explore the papers, your realize there are these beautiful, vintage papers too. I loved the thought of grey and pink together for Valentines Day, and my Valentines will wake up to this on the door! I took a few pictures of how to form the cone shape, since I found it a little tricky! First, take a 12 x 12 piece of paper that you love both sides, one will be the outside, while the other will show the inside. Cut it diagonally. With the point up, roll the paper back onto itself (see the pic!). I used glue dots to attach it originally, wrap the rest of the paper around and attach at the back. Decorate to your hearts content! All of the items used for this project can be found in this month's Splendid Deluxe Kit.